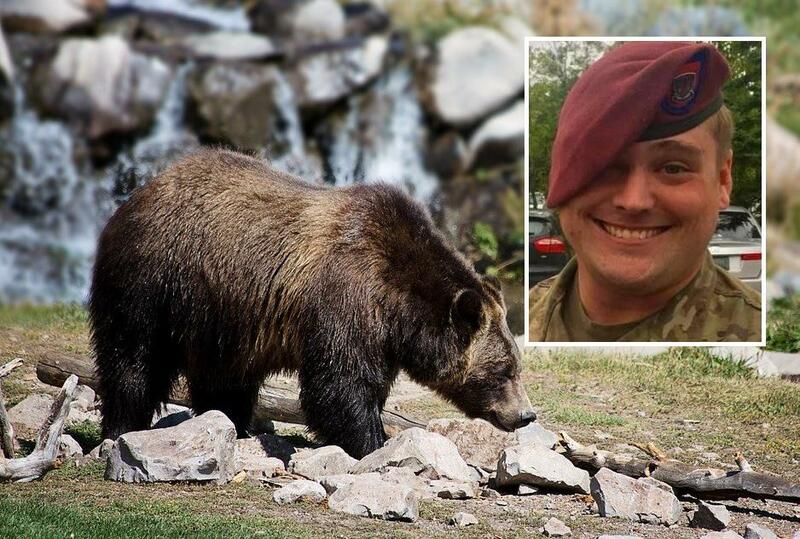 Alaska state police say a 28-year-old U.S. Army soldier is fighting for his life after an encounter with a bear went south. William McCormick, 28, shot a bear and it tumbled down a slope and landed on him. He was also injured by a falling rock that was knocked loose by the bear on its way down. A rescue helicopter took McCormick to a hospital in Anchorage, Alaska where he remains in critical condition. McCormick was hunting with a fellow army friend named Zachary Tennyson, 19, above Carter Lake near Moose Pass. Dispatchers in Soldotna were alerted to the incident around noon on Saturday after receiving a signal from an InReach satellite beacon. Alaskan state troopers wrote in a report, "The pair were hunting in the area and shot a bear above them on a ridge. The bear rolled down the slope dislodging rocks in the process. [McCormick] was injured when he was struck by both a rock and the bear." Members from the nearby Moose Pass and Bear Creek fire departments responded along with the state troopers. McCormick's hunting partner Tennyson was uninjured in the encounter but the bear did not survive. Alaska state trooper spokesman Tim DeSpain said that the bear that fell on McCormick weighed around 200-pounds. A LifeMed helicopter flew him to Providence Alaska Medical Center in Anchorage. McCormick's sustained "life-threatening injuries" according to troopers and he was still in serious condition as of Monday afternoon. Troopers also reported that both men live on Joint Base Elmendorf-Richardson. Both are soldiers serving with the base's 4th Brigade Combat Team (Airborne), 25th Infantry Division, according to U.S. Army Alaska spokesman Lt. Col. Martyn Crighton. McCormick is an Army specialist and Tennyson is a private first class. Details regarding how the incident went down are not clear other than a bear was at an elevated position relative to the hunters when McCormick was forced to take a shot. The bear was close enough that when it was struck by the shot it tumbled down the slope and landed squarely on McCormick. The Alaskan Fish and Game Department says that bears in the state are "waddling fat" at this time of the year which means they are packing on the pounds for winter hibernation. Mature male brown bears weigh up to 900 pounds while Grizzly bears can weigh up to 1,400 pounds. All bear hunters deserve the same fate. Another pos sociopath Army boy..
Once again junior enlisted provide evidence of why an NCO should always be near.